This page is under construction. Water & Coal, and Media pages from the archived site will be posted here soon. “The Whitehouse has become the East coast branch office of Exxon and Peabody Coal, and global warming has become the pre-eminent case of the contamination of our political process by money”. ~Ross Gelbspan, for 31 years an investigative reporter and editor, for the Philadelphia Bulletin, The Washington Post, and the Boston Globe. His work lead to a Pulitzer Prize. By Marley Shebala, Navajo Times, April 17, 2008 WINDOW ROCK – The 38-year-old Black Mesa Pipeline is retiring. No power plant aids N-aquifer Black Mesa Environmental Impact Statement to be reactivated By Kathy Helms, Gallup Independent, April 14, 2008. WINDOW ROCK – The Black Mesa Environmental Impact Statement is being reactivated, however the preferred alternative, which includes the C-aquifer pipeline, reportedly will be eliminated. 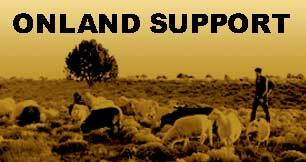 JOHN McCAIN’S RELOCATION LEGISLATION S1003 DOES NOT MAKE IT TO RESOLUTION! Senate Bill 1003 (The Navajo Hopi Land Settlement Act of 1974 Amendments) proposed by AZ Senator & Presidential hopeful John McCain did not come to a resolution! This bill would have had dire consequences for Dine’ families who continue to live on their ancestral homeland, for the families who have moved and for the land of Black Mesa. While S1003 passed through the Senate, it never made it out of the House Resources Committee to the House floor for a vote. The congressional session ended with no action being taken. Many thanks to all of the action taken in support of the Dineh and in stopping this bill, and in stopping the forced relocation laws. Thousands of letters, emails, and faxes were sent from throughout Indian Country and general support network, as well as the video sent to Congress that a Black Mesa resident and a BMIS volunteer compiled of statements from residents of the ‘Hopi Partitioned Lands’. SUMMARY of Peabody’s Black Mesa Project. Arizona utility seeks investors to reopen Mohave coal plant By Mark Golden 10/06/06 SAN FRANCISCO (MarketWatch) — A publicly owned Arizona utility is on the hunt for investors who will share its dream of restarting a shuttered coal-fired power plant in the Nevada desert that was abandoned by its other owners. Phoenix-based Salt River Project is working to build a new ownership group to buy and upgrade the 1,580-megawatt Mohave Generating Station….. Leaders mum on coal, water proposal By Marley Shebala, Navajo Times 03.30.06 Feds to control resources:….a draft does outline sweeping changes to the way water, coal, and other natural resources are governed on tribal land. For instance, the Navajo and Hopi tribes would agree to rescind measures prohibiting use of the Navajo Aquifer to slurry coal from Peabody’s Black Mesa Mine to the Mohave Generating Station in Nevada. The N-aquifer would continue to be available to Peabody’s use until a new slurry line is ready to hook into the Coconino Aquifer. The new slurry line would be financed and built by Edison and other utilities that co-own the Mohave power plant. Southern California Edison Co. and two Indian tribes have taken a tentative step toward reopening the giant Mohave power plant in Nevada that was shut down due to pollution. WINDOW ROCK — A proposed settlement agreement to keep Peabody Western Coal Co. operating on Black Mesa and return Mohave Generating Station to service would give the feds control over the C-Aquifer project and dismiss all claims against Peabody for injury to groundwater in the lease area. N-Aquifer water and bore the burden of pollution. Now that the facility has closed, we have a right to ask the owners of Mojave to help us make the transition to a better future, to repay the debt. Black Mesa Mine closes & relocation office disbands. Victory? Not according to many indigenous families of the Big Mountain communities. THE STRUGGLE CONTINUES. Hopi Near Agreement on Bio-Diesel Fuel Project by Office of Public Information The Hopi Tribal Council is near agreement with a Utah energy company in a joint venture to explore the possibility of building a coal liquefaction plant and an electric generating plant on ranch lands owned by the tribe. Mesa Coal Talks Continue. Shirley opposes grassroots plan, council interested. By Marley Shebala Navajo Times 02.02.06. The Navajo Nation is opposing a proposal from Navajo and Hopi communities that could possibly reap more than $40 million a year to replace lost revenues and jobs from the idled Black Mesa coalmine.…On Jan. 20, the Navajo Nation filed legal papers with the California Public Utilities Commission asking it to throw out the grassroots-generated Just Transition Plan. Attorney General Louis Denetsosie confirmed, however, that negotiations included discussions by the Hopi Tribe to temporarily withdraw its ban on Peabody’s use of the N-Aquifer if the Navajo nation also temporarily withdraws its opposition until planswere finalized to replace the N-Aquifer with the Coconino Aquifer. expand coal mining in the area. The current contender on Black Mesa appears to be this Headwaters, Inc. corporation that has signed a Memorandum of Understanding with the Hopi Tribal council. Very similar to the Reliant company concept, it appears to consist of 2 major initiatives: a coal liquification project and a electric power plant. Black Mesa mine in northern Arizona is likely to close as a result of the Dec. 31 closure of Southern California Edison’s Mohave Generating Station. Peabody’s Western Coal Co. informed more than 120 employees at Black Mesa….According to Peabody’s Web site, the company’s Black Mesa and Kayenta mines employ a total of 650 in the area of northeast Arizona near the Four Corners region. WASHINGTON (August 22, 2003) – Next week the Environmental Protection Agency plans to release its final rule on the Clean Air Act’s definition of “routine maintenance” that would allow more air pollution from approximately 17,000 industrial facilities across the country, according to NRDC (Natural Resources Defense Council).NRDC obtained a leaked copy of the final rule, which essentially repeals the “new source review” provision of the Clean Air Act. That provision requires industrial facilities to install modern pollution controls when they make upgrades to plants that increase air pollution. The new final rule would allow facilities to avoid installing pollution controls when they replace equipment — even if the upgrade increases pollution — as long as the cost of the replacement did not exceed 20 percent of the cost of what the EPA broadly defines as a “process unit.” For example, if a coal-fired power plant replaced a boiler whose cost was less than 20 percent of the replacement cost of the entire process unit — the boiler, turbine, generator and other equipment that turns coal into electricity — the company would not have to control the resulting pollution increases. See National Resource Defense Council’s Press Release. Negotiations With Reliant Energy Have Been Canceled!! Prelude to permanence for mine? 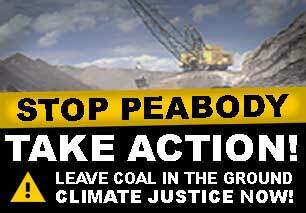 Peabody Group becomes Peabody Energy Corp.
A study of 10 years’ worth of federal court decisions reveals a pattern of judicial activism by conservative judges that is reshaping environmental law and limiting citizens’ access to the courthouse. Evidence about Mineral development plans of the Hopi Tribal Council. There is now clear evidence that the Hopi Tribal Council has plans to exploit coal resources in the Big Mountain area. Confidential maps and memos, supplied by Peabody Watch, Arizona, relating to the Peabody Western Coal Company’s mining expansion plans. Read about the class action lawsuit involving Lehman Brothers. Peabody Energy in the midst of developing $7 billion worth of mine-mouth coal-fired power plants in the U.S.
Hopis join Navajo lawsuit against coal, power firms. Articles reprinted under the fair use doctrine of international copyright law.